The function MessageDlg displays a message dialogue box in the centre of the screen. The function is declared as follows in Delphi 7. Call MessageDlg to bring up a message box and obtain the user's response. The message box displays the value of Msg, the string you pass to the function. Use the AType parameter to indicate the purpose of the dialogue. Use the AButtons parameter to indicate what buttons should appear in the message box. For example, [mbOK, mbCancel] puts the OK and Cancel buttons in the box. Set HelpCtx to zero if you are not supplying context-sensitive help. The following table shows for Delphi 7 most of the possible values for the responses, the types of message dialogue and the buttons. For our demonstration (using Lazarus) we added a radiogroup, button, and memo to the form. We double clicked on the radiogroup in the design form to obtain its editor, in which we added the names of our four options. The vital ItemIndex property of the radiogroup is zero-based. 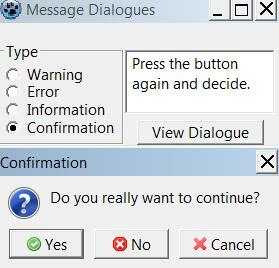 The screenshot shows the output after (i) selecting the confirmation, (ii) clicking on the View Dialog button, (iii) selecting Cancel and (iv) clicking again on View Dialog. Your code would normally, of course, do more on receiving a response than output messages. The essential code of the files needed for program MsgDialogDemo follows. You can download the three files for Lazarus in form_msg_dialog_demo.zip.